A comprehensive series of tests were done by the Lower Austrian specialised College of Bakers and Pastry Chefs in Baden, near Vienna, Austria. Under the supervision of the Department Head, certified Pedagogue Manfred Stefan, an extensive trial with revitalised water according to Johann Grander was carried out. 40 people participated in the test. The results were as puzzling as they were clear, in particular in the combination with organic wholemeal flour. 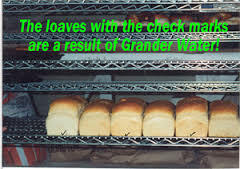 The different effect that Grander Water has on the dough development. The taste as well as the freshness after 3 days of the organic rye wholemeal flour should be established. The sourdough has a higher level of maturity. A more consistent fermentation- Dough development of the bread. The fermentation stability and tolerance is higher than normal wholemeal bread. When using ordinary tap water with normal wholemeal bread. The fermentation was irregular and sluggish. Larger volume: 16 volume parts more( 85cm3 more) . Upon cutting even pore formation. When cut there are slight defects in the bread due to the higher water amount. Taste and freshness after three days. Milder ( rounder) more full bodied taste. Subjectively more intensive acid taste. The ‘Grander Effect’ on Baking Bread. In the overall evaluation by the expert jury, consisting of Graduates of college, the bread made with Grander Revitalised Water received the mark of 4.78 ( 5 being the highest mark possible). Whereas the Normal bread. Made with tap water was given a mark of 3.72.